If you’ve been importing long enough you’ve probably found a competitor (probably on Amazon) selling the exact same product as you but at a lower price. You wonder if your competitor is simply sacrificing margins or if they’re getting their products for cheaper, and if so, from who. Or perhaps you’re just beginning working with a supplier and they tell you that they supply Walmart/Home Depot/<insert huge retailer here> and you wonder if they’re in fact being completely honest and really export to these companies. Guess what? Using an Import Records software tool (both free and paid options available) you can find out the answers to all of these questions. Thanks to public U.S. customs records, information about your competitors import history and your suppliers export history is easy to find. In the United States, customs data is public information. That means that any company that imports something into the U.S., and any company that exports anything to the U.S., leaves a paper trail behind them that is open to nearly anyone’s eyes (actually, you can request your information to be hidden but few, if any, companies do this. You can get access to all of this information through a Freedom of Information Request to the Department of Homeland security and paying thousands of dollars. However, thanks to some clever SaaS products, getting this information is much easier than dealing with government bureaucracy. Research tools which lean on public U.S. customs records can be extremely valuable for finding and verifying Suppliers. You can use a third party website such as ImportGenius, Panjiva, or PortExaminer. Import Genius and Panjiva are paid subscription services but Port Examiner is free. Let’s pretend you are in the automotive industry. One of your competitors is very likely to be Autozone Inc, the second largest retailer of after-market auto parts in the U.S. You notice that Autozone is selling wiper blades for extremely cheap and you wonder a) how they get them for so cheap and b) where they get them from. By accessing free customs data information through a website such as PortExaminer.com you can find out this information easily. See the image below. 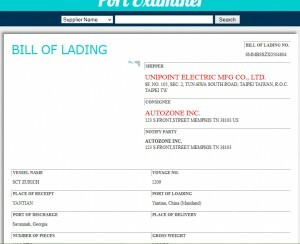 Paid tools like ImportGenius give you even more complete and better organized information as seen from the screenshot below listing over 20,000 records for Autozone Inc.
By simply searching for Autozone on PortExaminer I have been able to find dozens of copies of Bills of Lading that Autozone has used to import various products into the U.S. From the Bill of Lading shown above I have been able to determine that Autozone has imported from Unipoint Electric MFG Co. LTD in Taiwan. Further down (not shown above) it says that they imported 1262 wiper blades. By simply googling the name Unipoint Electric MFG Co. LTD I’ve found their website at http://www.unipoint.com.tw. The information above doesn’t tell me what exact type of wiper blades they imported or how much they paid. However, I do know that Unipoint Electric MFG Co. LTD likely sells a reasonable quality product at a reasonable price by virtue of the fact that they’re selling to a major retailer like Autozone. Chances are, Unipoint Electric MFG Co. Ltd would likely be happy to sell to you directly as well provided your order is large enough (and we know their MOQ is likely not any higher than 1262 pieces). Tools like PortExaminer and ImportGenius prove their weight in gold when you can find a Supplier that isn’t listed on Alibaba. The vast majority of importers use Alibaba exclusively to find Suppliers, so if you can find a Supplier who doesn’t advertise on Alibaba, you’ve automatically reduced the amount of competition you’re going to have for that product. There’s a serious lack of tools and apps related to importing. And while public customs data information isn’t the be all and end all for doing competitive research, for the limited time and money it takes to perform, it’s an excellent place to start. Have you had any luck using customs information to find suppliers or do verification on Suppliers? If so, please comment below. What is the reason that "Many Chinese companies hide their activities by exporting under the name of another company/trading company"? Mainly to protect their buyers but often these companies have such a web of subsidiaries and trading companies they operate under that it happens inadvertently. Do any of the services show what is the cargo value for individual shipment records? For example, the value of 1 container widgets imported from China. I've used Import Genius before and wasn't able to find this this information. I really can't remember but if import genius isn't revealing it then it's probably not available. Hi, Do you recommend Panjiva? How it compares to ImportGenius? Thanks. They're both pulling from the same data source so they're pretty comparable IMO. How recent is the data? Since Port Examiner is free, do they get older data or more incomplete? With all the tariff talks, this type of info will be more important. Yes, Port Examiner's data tends to be far less complete/older. Hi, Import genius provides information about who imports them from china to Venezuela and who are their suppliers? Thank you. Hi, I don't think Venezuela is included at this time. I just learning about ECommerce, I love this blog, it's another piece in a great puzzle, thank you. Great info! Very helpful, im currently sourcing for good suppliers which I am having a bit of difficulty with, many of the sample products I have been made though ALibaba are below quality and is costing me quite a lot of money. It's a wide spectrum of quality with China in general. Many great suppliers and many not so great. 2. The companies selling customs data, like Import Genius, Panjiva, PIERS, etc. Besides US customs data, do you have any idea how these guys are sourcing their data, and how I'd get ahold of it myself? Thanks in advance. Hi Brendan - my understanding was that it only comes from U.S. customs directly. I do not think the shipping customers are selling manifest data.